Disney and Marvel have collaborated on the very first computer animated movie, “Big Hero 6,” which opens Nov. 7. Don Hall, the director of the film at Walt Disney Animation Studios, utilized brand new computer technology to bring this origin super hero gang story to life. Fans of the CGI movie have multiple video game choices out there. Disney Interactive enlisted Gumi Asia to create “Big Hero 6 Bot Fight” for Android, iOS and Windows devices. The game is based on the illegal remote controlled robot fighting that the game’s protagonist, Hiro Hamada, takes part in to open the movie. Disney Interactive has also released Hiro and robot Baymax characters for “Disney Infinity: Marvel Super Heroes,” which allows fans to play with the newest super heroes in the game’s Toy Box mode. And finally, GameMill Entertainment has a new Nintendo 3DS and Nintendo DS game, “Big Hero 6: Battle in the Bay” available. How much creative freedom did you have with these characters, especially since so many people weren’t familiar with the comic? How did you blend Disney’s animation filmmaking with the Marvel characters? We took the ideas of the characters and the character’s names, but then we reinvented them to suit the story that we were telling. Really it became sort of an original story in an original world. Having “Wreck-It Ralph” come out of the same studio, how do you feel video games have influenced the look and feel of Sanfransokyo? For Sanfransokyo, we were influenced by a lot of things, from anime and other influences that maybe don’t usually make it into a Disney film and I think video games are part of the mix. 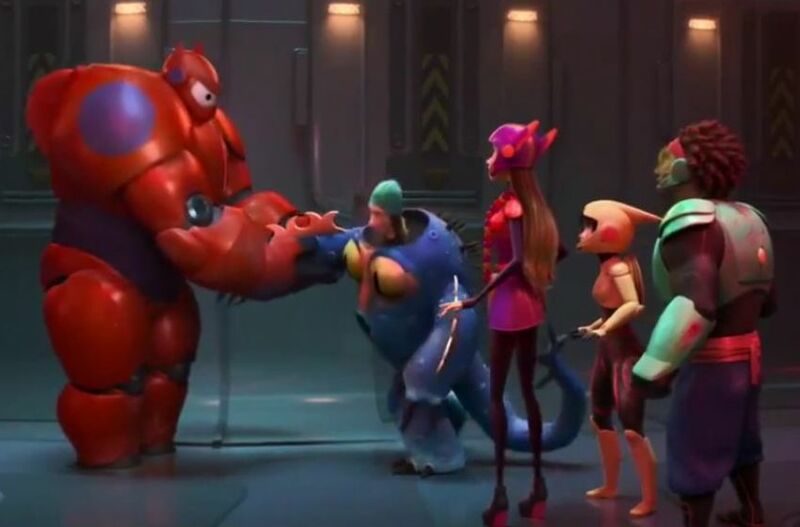 What opportunities has “Disney Infinity 2.0” opened up for the characters like Hiro and Baymax? We’ve been so busy I haven’t been kept abreast of everything they’re doing in the “Disney Infinity” game. I’ve seen a couple of little tests from it and it looks really cool. I know there are some micro bots and Hiro and Baymax are in it and it looks really cool. What role do you see mobile games like “Big Hero 6 Bot Fight” playing today with the proliferation of smartphones and tablets? I base everything on my kids, who are 7 and 10. They play everything on iPads, so I know that that is currently one of the biggest platforms for video games. It’s absolutely essential that we make great video games for these smartphone devices. Unfortunately, because we were so busy finishing the movie, Roy Connolly, the producer, kept us abreast a little bit. But we weren’t as involved in the video game stuff only because we were just so busy trying to get the movie done. That’s a great question. We have put everything we have into finishing this movie and we’ve really not put a lot of thought into what happens next, if there’s a sequel or whatever. We really had put everything into this. That said, we did fall in love with these characters and because they become very real to us, it’s hard to say where the franchise will go. I hope the future is bright, though. There’s a trend with releasing a musical followed by a nonmusical from Disney Animation Studios. That is a little intentional in that we don’t want to be defined by any one type of film and we like the luxury of growing our brand and showing that Disney Animation can do all kinds of different movies, whether it’s a princess movie like “Tangled,” a musical like “Frozen,” or “Wreck-It Ralph” which is set in the video game movie genre. And then this film, which is based on a comic book, we just feel like we can do anything at this point, and not just musicals or not just one thing. We want to be all things. You used a lot of new technology with this film, how close do you see this affecting the video game world in the future? It’s hard for me to know how closely it can affect the video game world only because of I don’t know the memory with which we create. I know the world we create is very dense and was very difficult to make. If that could translate to a video game, I think that would be amazing.